Seven to Eternity #6 takes the story to a dark place. For starters, they’re in an evil swamp. They’re lost. Their only hope lies in the strength of each other, but with the Mud King manipulating them, they become fractured. Decisions are made, fates are set, but even in the darkness, there is always the hope of light. Swamps tend to be dark places with unseen threats. In this swamp, readers find out just what kind of dark secrets it’s hiding. As the swamp makes its move, the action kicks in, and everyone is brought to their limit to survive. Yet such struggle and desperation provides opportunity for the Mud King. The issue holds some surprises as characters are lost and gained. The one thread of continuity is Adam Osiris still being up the air with his actions. On one hand he wants to do what’s right and put an end to the Mud King. On the other hand, he’d like to live and see his family again. Life is never easy, and this issue shows how quickly decisions can lead one astray. The writing is still top notch in this issue with its weaving story and rich characters. There’s twists, turns and surprises with heaps of drama and suspense. It’s the kind of storytelling that pulls you into the story and won’t let go, even when the issue ends. That’s when the questions kick in. What will happen next? Remender keeps readers on their toes as nothing pans out the way you would expect it to. 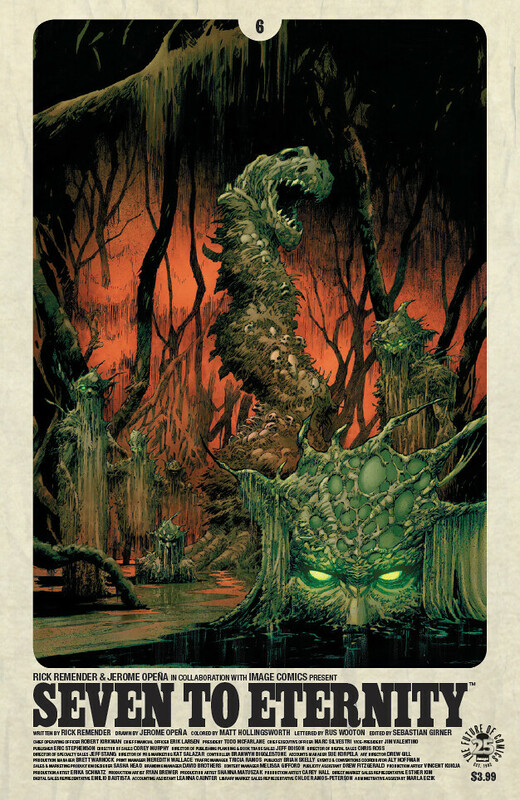 Meanwhile Jerome Opena and Matt Hollingsworth complete the reality of the story with their excellent visuals. The details, the action, the focus of the panels, it all comes together to tell a seamless, sweeping story with imagery alone. From the writing to the artwork, Seven to Eternity #6 scores on all marks. I give it a five out of five metal bikinis.